Part 5: Whatever happened to Flossie? Continuing our journey, we head for the top of the mountain. This part of Benevenagh used to be wonderfully shady, with large trees competing for scarce sunlight, but nowadays Ballyhanna forest is a pitiful collection of dead stumps and miserable looking leftovers. Homeless buzzards swoop above a violated landscape; their nests have been sacrificed to the human need for chipboard. In three or four years' time, when the secondary growth becomes visible, this place will look nice again, one hopes. 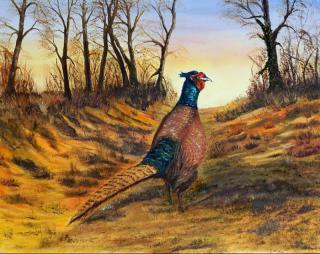 We park at the side of the road, and watch a pheasant promenading up a small overgrown lane. As expected, Meg whispers: "That one I've got to paint!" "Shoot me! ...... Shoot me! ..... Shoot me!" We fear that somebody will do just that - if only to stop the noise - and drive off just as the bullets start buzzing. Judging by the sound of the barrage, the unseen hunters are better at loading than aiming. It is about time to pontificate about this mountain. 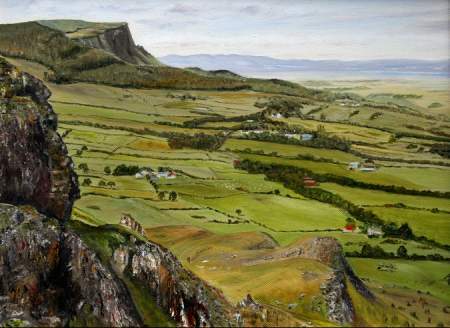 Not only is Benevenagh an 'Area of Outstanding Natural Beauty' and a 'Countryside Policy Area' (poetically called AONB and - believe it or not - CPA), but it is also an 'Area of Restricted Mineral Development' - which explains the scandalous absence of gold mines in them thare hills. 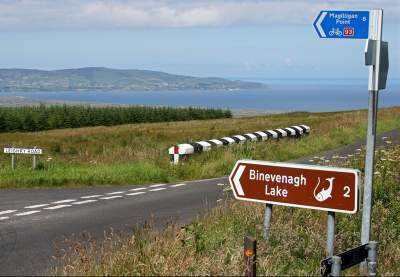 People not from the area, spell the name of the mountain 'Binevenagh' rather than 'Benevenagh'. This began - some think - with a spelling mistake on an old map, in which case the Ordnance Survey has a lot to answer for. However, as we shall find out further down the road, spelling mistakes are not unusual around here. We roll down a long steep road and stop at the a rather scenic road sign. This is where Leighry Road joins the Bishops Road and whilst admiring the view we study an interesting road sign. Against all the odds there seems to be a whaling lake just two somethings to the left. "The anglers around here must use steel hawsers" I mutter in astonishment. Meg's comment is more to the point: "Lamb chops with whale sushi and rosemary" she drools "that sounds like our kind of lunch". After a statement like that we just have to turn left. 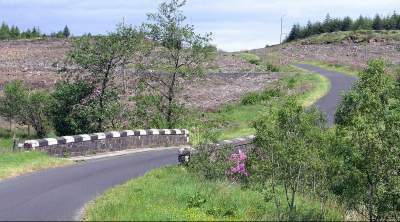 To the left is the steep Leighry Road, which connects the coast below with the top of the mountain. The builders didn't bother about silly hairpin bends and scenic parking places - they just built the thing straight up. They were better at building roads than spelling though, because the sign at the bottom of the road reads 'Leighery Road', but up here it's only 'Leighry Road'. It seems that this stretch of near vertical tarmac is the only road in Ulster so steep, it has to shed an 'E' to make it all the way to the top. Most of the forest around here has recently been savaged but some trees remain. 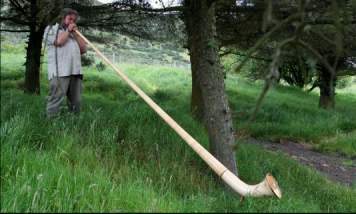 Half-way down near an unexpected house, we hear the unmistakable sound of an alpenhorn. "Boooom, boooom, booooooom" - "Cuckoo". It sounds like either Strauss or Brahms - if it isn't Bruckner. Flossie is so frightened she nearly jumps out of her skin and hits the side of the car with such velocity that she leaves a sizeable bump and two horn-sized holes. To our left, in amongst the trees, we spot a helvetic-looking gentleman whose powers of wind certainly seem to match the instrument he his trying to control. A cuckoo perches on his left shoulder. Alpenhorns are very elongated things, so we bow respectfully as we pass. "Boooom, boooom! booooooom!" - "Cuckoooo...ooh.....oooooh"
We turn left at the next sign and drive up a bumpy forestry road towards the distant edge of the mountain. The view - as always around here - is splendid - but the ruts in the road are so deep, we can't really concentrate on anything else. A final steep bend takes us up to Benevenagh lake. It is a rather unexpected sight and the small dam that tames the clear waters is only about 500 meters away from the cliff's edge. Many walkers come here to enjoy the splendid views, but they are outnumbered by countless adventurous looking fishermen, who line the shore. 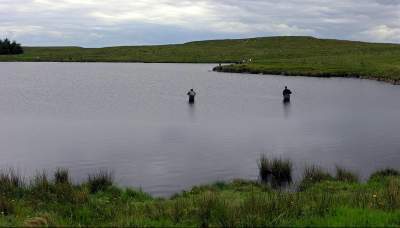 Mind you, there is room for all and there is even a corner for half anglers. As it is too early for lunch we don't bother with marine mammals just yet and take a walk along the cliff-edge. The view is superb - as long as you remember to duck every once in a while to let the gliders go by. These big silent birds use the cliff face updraught to swoop just above our heads. However, some of the pilots don't seem to know where the mountain ends and where the average walker begins, so our walk turns into a tedious mile-long crawl. What with stumbling cows, low flying gliders and overstretched alpenhorns, this mountain seems to be quite dangerous. 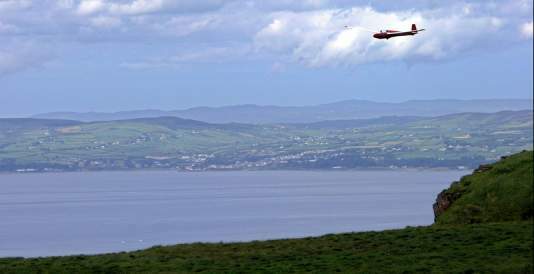 Below us is the Magilligan peninsula and across the water the mountains of Inishowen guard the shores of Lough Foyle. It really is a superb view. People not familiar with the area will be interested to know, that this is one of the few places on earth where you have to look West to see the South. But enough of these geo-political reflections. It is time to return to the car for our harpoon so that we can land our lunch. Back at the vehicle a dire emergency seems to have developed in our absence. This time Flossie has punched two neat holes into the other side of the car and she looks rather pleased with the extra air circulating around her tiny horns. The reason for her sudden panic attack is immediately obvious because we can't help but notice a bedraggled looking figure dressed in a pilot's outfit sitting on the dented roof of our car. Bits and pieces of glider lying about the place make our approach more difficult than his must have been. A large brass angling spoon dangles from the nose of the wrecked air plane.It is connected via a strong nylon line to the upper half of a rather smug-looking angler, who is about to rise from the foams, sporting a huge grin, a very large net and a fearful looking wooden flail. "He didn't even use a harpoon!" I mutter, as I survey the scene. We shoo the dazed pilot from off the roof of our car, crunch through the remains of the glider, bid the triumphant angler a cheerful farewell and leave without so much as a whale bone. The errant air-male whimpers a timid "Fare well" and we move on. Ah well. Thar goes our lunch yet again. "I hope they choke on it!" says Meg with much feeling. We reach the Bishops road again and turn left towards Downhill. The road is so narrow that two cars can just about pass each other if the drivers don't mind a few scratches. We are beyond caring - at this rate our car will only last for a few more hours anyway. Magilligan, the jail and two savaged yows Not only is the road narrow, but oncoming drivers tend to watch the view rather than the traffic, which explains why the next car nearly tips us into a field. We stop near Tircreven Road to catch our breath. This time we've only lost some paint and a bit of the running board. Not to worry, we aren't in a hurry anyway. Tircreven Road is even steeper than Leighrey Road and goodness only knows how many 'E's' it has down at the bottom of the mountain to still have two left up here. We examine the Magilligan jail complex and Flossie gets quite a fright when she meets some of her local compatriots - who look as if they have just been savaged by a lion. They obviously belong to a farmer with a sense of fun and a large bucket of red paint. 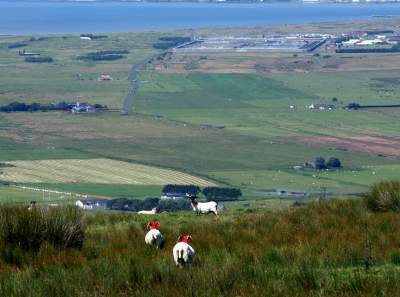 Our next stop is the Gortmore viewing point from whence one has a magnificent view of the cliffs of Benevenagh, the Roe mouth, the Magilligan peninsula and Lough Foyle all the way to distant Derry. Opposite are the hills of Donegal. 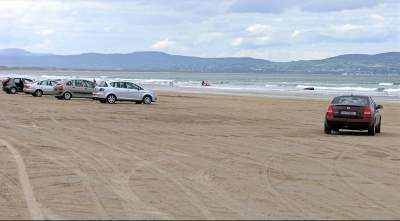 Unfortunately one also sees the Benone Caravan sites, which are a dreadful scar on the landscape. Above the viewing point the AA have erected a small bronze table mapping the Inishowen mountains one can see across the lough. There is Croaghconnellagh and Croaghnageer, Croaghnacraddy and Croaghnamaddy, in fact: an endless number of monotonous sounding Croaghs followed by a random arrangement of other noises. As I said already, they have a way with words around here, but rest assured: those mountains are healthier than they sound! Meg groans: "I've got to paint this", whips out the oils and brushes and spends the next ten minutes recording the view for posterity. 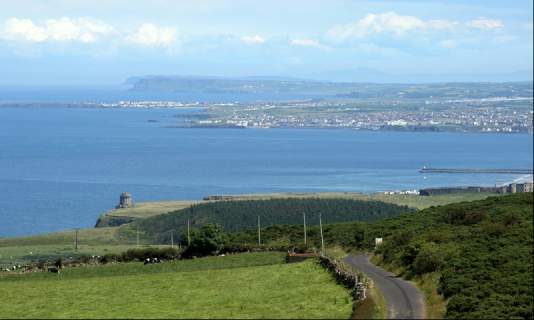 Bishops Road with Mussenden temple on the left, the palace on the right and Portrush in the background From here on it is downhill to Downhill all the way. Soon we spot the ruins of the Bishop's Palace and lovely Mussenden temple. Portrush, the river Bann and the Causeway Coast form a magnificent backdrop. Bishop Hervey, the Earl of Bristol, was a character - by all accounts - and his buildings have inherited some of his qualities. Bristol was a famous traveller and many a 'Hotel Bristol' on the continent used to commemorate his visits. Why he would want to travel so much when he had such a nice place over here is anyone's guess. The vast palace has fallen into wreck and ruin but Mussenden temple - a Victorian folly in the Roman tradition - is still clinging on, though the cliff is threatening to swallow it. The lovely road we have been travelling on - 'The Bishops Road' - is of course also named after the long-gone eccentric. A rather steep series of bends with high rocks to the right and splendid views across the Atlantic and Lough Foyle to the left guide us down towards Downhill beach. 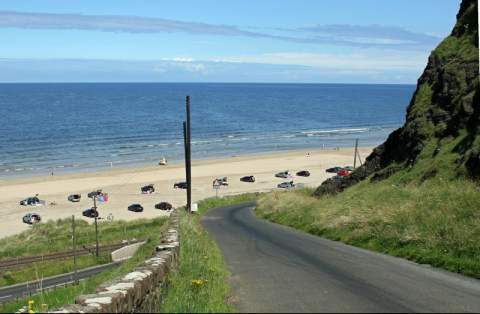 This links up with Benone beach to form one of the longest sandy stretches in Europe. Whoever named Downhill 'Downhill' must have had a rare talent for stating the obvious. Mind you, as it hardly ever snows around here the name also has the potential to lead lovers of winter-sports seriously astray. The little hamlet - which just borders the Limavady district - is a strange place. Surrounded by the most spectacular scenery imaginable, crowned by that wonderful bishopy love-nest, it looks at the moment like a total dump. A building site dominates the centre, a fenced-off area - the former car park - is filled with building rubble and most of the rest of the place is a building site. But who wants to count bricks when one can drive up and down that spectacular beach? A wonderful idea! We join the throng, steer our disintegrating conveyance onto the sandy expanse and hit the accelerator. We drive past angry-looking bathers who try to reach the water, but can't get there because of the traffic. Imagine - coming to the seaside to have a swim. Whatever will they think of next! For the next ten minutes we race up and down the beach and inhale the invigorating salty sea air mixed with wonderful exhaust fumes. Isn't a visit to the beach relaxing? Suddenly we hear a thunderous noise. A wave, which looks suspiciously like something started by the flip of a dolphin's fin half a planet away, washes around the car. A trickle of water squirts through the holes that Flossie made, we float for a few precious seconds - have just enough time to get seasick and then the tide retreats as suddenly as it came. With it floats our spare wheel. Oh well, who needs five wheels anyway? "Stop what's left of the car! I've got to paint this!" From underneath Flossie and the as yet untouched picnic she extracts canvas, brushes and oils and starts to record the scene for posterity. 42 seconds later, with the smell of drying paints of various colours still wafting in the breeze, we move on. As we leave there is a funny crunch from beneath the car and bits of yellow fibre-glass fly past in all directions. In our damaged mirror I notice a distant figure in a wetsuit waving its arms furiously. "Whatever does he want?" I wonder aloud. "Maybe he suffers from cramps" says Meg, as we drive off.